What you eat before a workout affects your exercise performance, energy, strength and stamina throughout the workout. It is probably because of this reason that celebrity fitness trainer Kayla Itsines took to Instagram to share about a protein bar which can indeed be the perfect pre-workout snack. What's more is that this protein bar can also be consumed by all the vegans out there. All you need few ingredients, most of which can be found at home, and your vegan protein is ready for you to munch before your head for a workout. These protein bars are made with nuts, seeds and dates. With a delicious drizzle of dark chocolate on the top, these protein bars can be your go-to option every time you experience hunger pangs. The highlight of these vegan protein bars is that they are prepared with ingredients that can also be over salads, toasts, smoothies, etc. Even better, their preparation time is nothing more than 15 minutes! For preparing these vegan protein bars, you need to take around 6 pitted dates, place them in a bowl and cover them with hot water. Soak them for 15 minutes and then drain well. Take chia seeds (2 tbsp), flaxseeds (4 tbsp), roasted almonds (150 gms), sunflower seeds (20 gms), goji berries (2 tbsp), dessicated coconut (40 gm), a pinch of tea salt and a vegan protein powder of your choice (protein powder is optional). 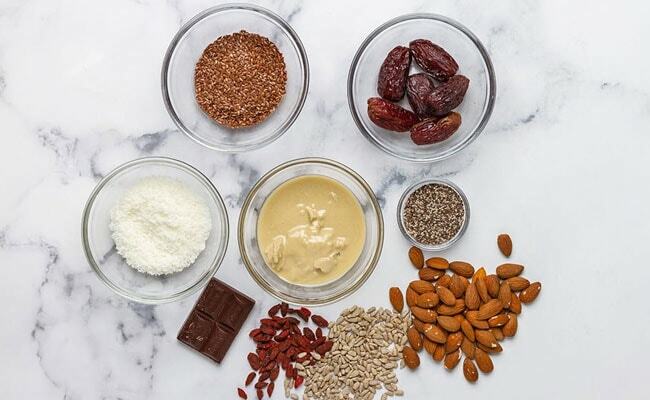 Add all these ingredients (not the dates) in a grinder and grind them into a flour. Take soaked dates and around 110 gms of tahini (made from toasted ground hulled sesame seeds), and add to the mixture and grind it further for another 30 seconds. Make sure the whole mix is well mixed and has a sticky texture to it. Place them in a rectangular container and refrigerate for around an hour. Remove the mixture from the container and cut around 10 even-sized bars. Using a fork, you can drizzle some melted dark chocolate on the bars. This is also optional. If you are adding the chocolate, place the bars in the fridge again to let the chocolate set over the bars. You can store these protein bars in an airtight container and have them before your workout. 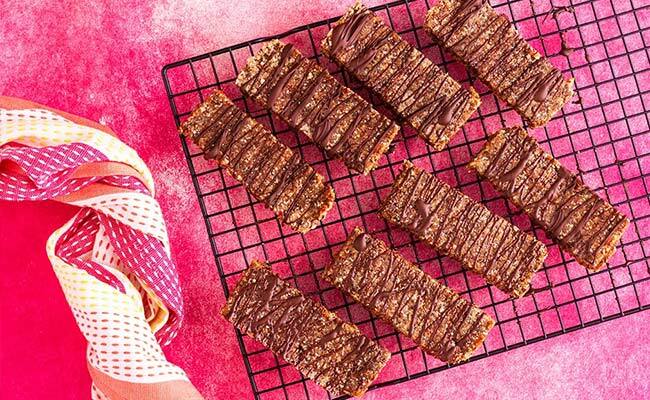 Instead of opting for packaged protein bars with artificial flavours, have these natural and homemade vegan protein bars for good health and optimum workout efficiency.